This year, more than any in recent memory, the NBA is about windows of opportunity. As we gear up for what could be a classic season, Grantland will take a close look at the ones that matter. It’s a cliché to describe any athlete as a “force of nature,” but I use the phrase all the time. Certain players are so good that they can swing games all by themselves. They’re just that relentless, and over the course of a full game, eventually they render other teams helpless. Derrick Rose was a force of nature. It’s become popular to say Rose didn’t deserve the MVP award he won in 2011, almost like an accepted fact of history. That was the year voters got it wrong, everyone says now. But we say that now only because it’s been so long since we saw that MVP version of Derrick Rose playing basketball. That version of Rose could do everything. He averaged 25 points per game with 7.7 assists, he played defense on the toughest defensive team in the league, and he led the Bulls to the best record in basketball. One of the most vivid memories I have from that season was a Bulls-Spurs game in the middle of February. That night, it didn’t matter what Gregg Popovich did, or who the Spurs had, because the Bulls had Derrick Rose. Almost every basketball article these days has a YouTube video embedded in there somewhere, but you should actually watch this one. Watch Rose freeze the defense and pull up from anywhere, watch him career into the lane and draw contact and then hang in the air to finish. Watch him do whatever he wants. You could get into semantics about who was actually most valuable that year — stats favored Dwight Howard; the most talented was always LeBron James — but it’s hard to watch Rose against the Spurs and say anyone made a mistake in 2011. He was as dominant as any player during that regular season. He could dismantle defenses all by himself, and the Bulls won 62 games. Now it’s three years later, and the biggest question coming into this NBA season is about the Bulls and Derrick Rose. We know the Cavs will be good. We know the Thunder and Spurs will be back and the rest of the West will be murderous. We can even count on the Raptors and Wizards to get better and make things interesting in the East. But what about Chicago? Think back to a year ago, and this discussion went differently. Everything was building to the comeback. The Bulls were looming as the biggest challengers to the Heat, all the pieces were still in place, and once they got their MVP back, the NBA was getting one more title contender. The entire basketball world was ready for Rose to bounce back and make the whole league more interesting. Twelve months later: The Cavs are the juggernaut in the East that’s waiting for a challenger, and the Bulls still loom. All the pieces are in place. But it’s hard to put much faith in Derrick Rose. Even during the lockout season following his MVP year, Rose looked banged up and overworked. More human. He missed various stretches with a bad ankle, and when he wasn’t on the sideline it looked like he was playing hurt. Then came the blown knee in the playoffs, and then almost two full seasons that were lost to the ether while he sat on the bench in street clothes. In the 10 games he played last year, Rose averaged 15.9 points, shot 35 percent, and never quite looked like himself. He had some of his explosiveness back, but his timing was off and his jumper was worse. Incidentally, that description works just as well to describe everything he did playing with Team USA at the FIBA Basketball World Cup last month. He was settling for more jumpers than he used to, and shooting worse than ever. He didn’t get injured, but he never looked that healthy. Meanwhile, the Bulls have stayed pretty much the same throughout all of this. They’ve swapped Luol Deng for Jimmy Butler on the wing, they brought in Pau Gasol to play the role that once belonged to Carlos Boozer, and Taj Gibson has turned into a terror off the bench. But the defense is still anchored by Joakim Noah in the paint and Tom Thibodeau going hoarse from the sideline, and the offense will still be an adventure against the best teams in basketball. The front office tried and failed to steal Carmelo Anthony or Kevin Love this summer, and instead walked away selling fans on the ghost of Gasol and the rookie tandem of Doug McDermott and Nikola Mirotic. Vegas set the over-under for Bulls wins this year at 55.5. That puts Chicago three games behind the Cavs (58.5) and a full six games ahead of anyone else in the East (Wizards, Raptors at 49.5). The last two Bulls seasons ended with 45 (2013) and 48 wins (2014), where overmatched teams grinded their way to the middle of the East. Clearly, Vegas expects more this year. Whether you take the over or under for Bulls wins basically becomes a bet about Derrick Rose. 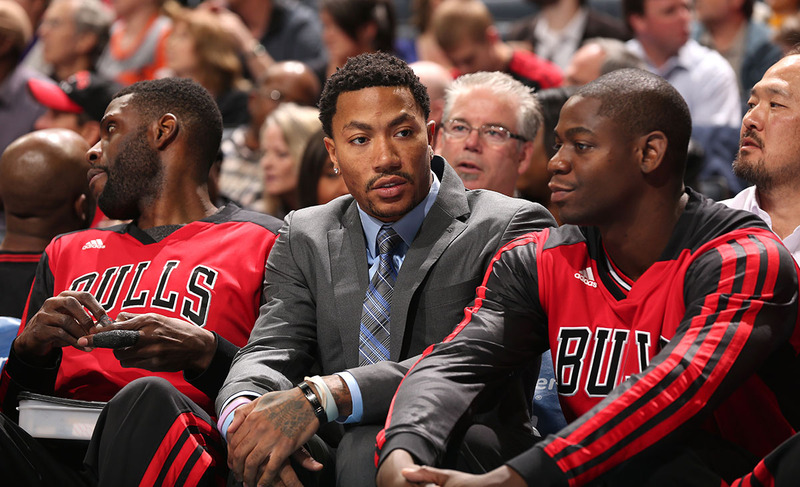 The Bulls will be good regardless, but they’ll probably only be great if Rose is, too. He’s the catalyst who can take the same old overmatched Bulls team and put them in a class with the Cavs. Or, if he’s not good enough, this is probably the same old overmatched Bulls team, and we should stop putting them in the same class as the Cavs. No amount of Pau window dressing or Mirotic landscaping can hide the fact that the entire foundation still rests on Rose. I didn’t realize how badly I want Derrick Rose to be great again until I watched those old highlights against the Spurs. It’s easy to forget what we’re missing, because all we’ve had the past few years is a stone-faced Rose and a bunch of angry columns. It’s easy to forget how much fun it used to be watching this point guard destroy entire teams while the sold-out United Center melted around him. I will argue to the death that Rose was even better than everyone remembers. But it’s getting harder to argue with anyone who says he’ll never be the same. This is where the discussion get depressing. Whether you point to Amar’e Stoudemire, or Penny Hardaway, or Gilbert Arenas, recent NBA history is littered with examples of players who were just never the same after knee injuries. Russell Westbrook is one outlier, but he’s a mutant invented in a laboratory. A year ago, we might have been able to put Rose in the Westbrook category — a freak who would defy the odds — but right now we’ve got too much evidence pointing to that first category. These previews are about windows of opportunity, and nothing is technically closed in Chicago. But in three years, we’ve gone from counting on a decadelong reign for Rose & Co. to this state of limbo. There are no guarantees anymore, just hopeful reports from workouts behind closed doors. The Return that felt inevitable last year now ends in a question mark. If anything, it feels smarter to bet against him. Rose has gone from a force of nature to the NBA’s reminder that sometimes nature can be cruel. For every superstar who defies the odds and looks superhuman for an entire decade, there are players like Rose who remind you that even the brightest stars can burn out, and knee cartilage matters. One way or another, this season will make things official. The limbo ends in 2014. That’s all we can say for sure. Either Rose returns to something like the player he was, or the NBA will stop waiting, Vegas will stop buying into the Bulls, and everyone will officially adjust to the reality we saw at the FIBA World Cup: The youngest MVP in league history is a 26-year-old reminder of mortality.